I don't ever remember meeting anyone famous as a kid. I don't have any treasured crumpled napkins with a scrawled signature on it. I'm not sure if it was lack of opportunity or luck, but it certainly wasn't for lack trying. It just never seemed to work out. Maybe that is why I am an autograph hound now. It kicked into full swing at Indians training camp, athletes relaxed and friendly, scribbling away on whatever is shakily shoved in front of them. There is something right with the world when you meet someone you admire or wear their name on a jersey and that person ends up being cool. 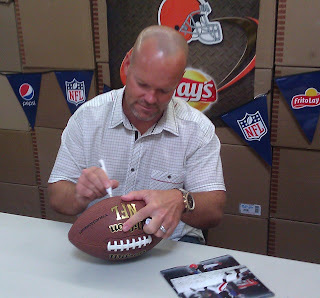 I squealed with delight when I met Phil Dawson. 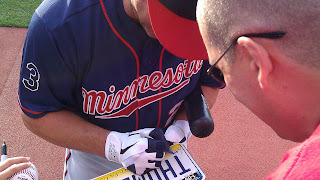 I almost passed out meeting Jim Thome. I have baseballs, footballs, photos and other memorabilia signed and enshrined in frames or cases. It is a fun hobby that is FREE. I see it as a game, so watch out Bernie Kosar, you sir, are next.